I am SO disappointed in India’s Most Wanted!!!!! First, it is yet another Zero Dark Thirty style film, rah rah go India capturing a traitor and a terrorist, ominous images of the Namaz and all that. You know, watching someone pray is always so scary. I mean, really??? We’ve just accepted this now, that the Namaz deserves the same background music as you would give someone assembling a gun? I do like that the “death death!” quote is from Hinduism, that’s kind of nice. But it’s not enough to redeem the film for me. Also, the look of it is not as intelligent as I was hoping. I wanted something like D-Day where an unexpected varied group of people (action hero, undercover agent, female agent) work together and challenge our perceptions. But instead it looks like it goes a little farther than that, makes them a gang of misfits and “ha-ha, look at them” types. Only they are also all male and youngish and Hindu. So the film may be saying “ha-ha, misfits” but what I am seeing is “ha-ha, wish fulfillment for the young male audience that wants to imagine they could do great things if only they had a chance”. It’s talking to a baser instinct, not encouraging us to think in a new way. Mostly it’s just not filmed in an intelligent manner. All these beats are predictable, the evil Namaz shot, the guys standing around as they are told “you can’t do it”, and so on and so forth. There’s no wit, it’s just jumping on the same empty patriotism fantasies as every other film instead of putting in some effort. Remember in the Raid teaser how there was that shot that flipped from one side of the peephole in the entry door to the other? That’s the kind of intelligent filming I mean, putting in an effort to come up with a new way to film in order to best tell this story. And Arjun looks uninteresting. That’s not just a shallow comment, he is the hero of the film and represents what it aspires to be. If he had been given an unusual look for a hero it would have told me that the film aspires to be something unusual. But instead it is this very precise and styled facial hair, a movie star look not something an every man would have. Also a little disappointed in this one! I knew it was based on two 60 year old female sharpshooters, which is a great story right there. And Bhumi and Taapsee played the lead roles, which was great casting. 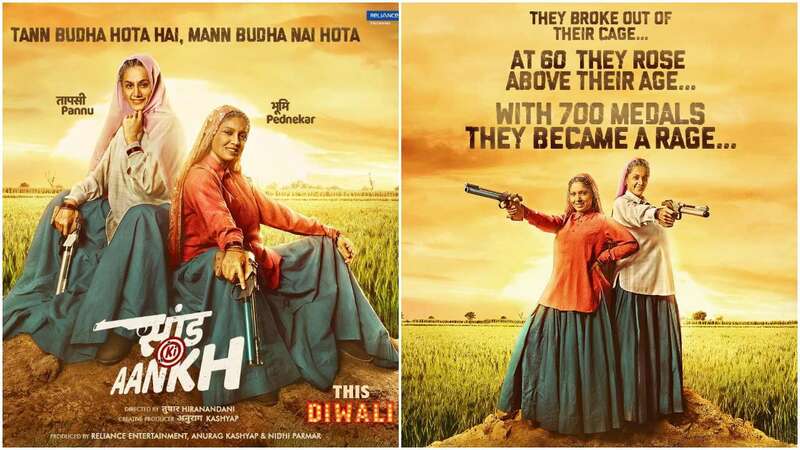 But what I didn’t realize until this poster released is that Bhumi and Taapsee are playing the woman at age 60. I thought they would be playing them as they were at a younger age. I’m excited for the story of two 60 year old heroines, that parts great. But I am disappointed that I will have to watch Taapsee and Bhumi in old age make-up. And I am really disappointed that Anurag Kashyap didn’t cast actual 60 year olds to play these roles! Can you imagine how amazing Rekha and Shabana Azmi, or Hema and Jaya, or Farida Jalal and Neena Gupta, or any number of other actresses Of An Age would have been? I will try to hold out hope, maybe this is just an image from the end of the film and for most of the film it is telling the story that lead them to the place where they became sharpshooters. Surprisingly, Bharat is the one that didn’t disappoint me! Two new images came out, a young poster and an old poster for Salman’s character. The old poster looks really good, not awkward make-up at all, he still looks like himself, but an aged version. With a nice every man nobility and strength to it. I want to see a movie about this guy! The other poster, I am less interested in. It’s okay, it’s the same image we got from the teaser. But it doesn’t make me excited. On the other hand, it also doesn’t make me un-excited. What do you think? Am I being too hard on India’s Most Wanted? Or not hard enough on Bharat? This entry was posted in Uncategorized and tagged Arjun Kapoor, Bharat, India's Most Wanted, Saand Ki Aankh, Salman Khan by mredlich21. Bookmark the permalink. Bharat – I was also pleasantly surprised by this first poster. Salman should always look like this! I hope you are right about Saand Ki Aankh! And I am glad there is someone who appreciates Arjun’s look, even if it isn’t me. Agree about Salman! He looks wise and noble and strong, instead of trying to hard and young and stupid. Do you think we would talk about Saand Ki Aankh if it was Rekha and Shabana Azmi movie? And really I don’t think Bhumi and Taapsee are that far off from Rekha and Shabana. They are younger and more exciting, but they aren’t as big stars yet. It’s not like this is Anushka and Dips. I don’t know how much action is required in this movie. Maybe they thought the older ladies wouldn’t be able to do it? You’d need 60 year old actors who are very physically fit. The aging make-up looks weird and they really don’t look right. Anyway, I never like these rural movies. Not interested in the Salman movie either. Are you sure it’s a Namaz shot? He seems to be sitting on a bed whereas Namaz is read with legs folded under you on the floor. Thank goodness, WordPress tweets every single post I put up, so I don’t have to do it and they are all out there already. I am trying to be better about retweeting and adding hashtags (that same update that got rid of all your logins also got rid of my ability to add hashtags automatically). And please please be the friend who makes me cool! I am so uncool right now. Hashtags won’t do it IMO. What you need to do is tag actor’s twitter accounts. The top actors won’t notice but their fans will especially those that have big fan bases. You could even tag the fan clubs directly. I see even the media doing that because it ensures their article gets around. Automatic twitter posts won’t work, honestly. You need to write them yourself in a creative way. For the smaller actors, it’s even easier. If you tag them, they sometimes notice themselves and will retweet the article to their followers if they like it. This would work well for movie reviews. I’m speaking from experience because I had a blog a long long time ago (gave it up in only 6 months!) and a few celebrities retweeted my articles and some smaller ones even followed the blog’s twitter account. Everyone likes flattery so if it’s a good review, you will get retweeted by the actor or his/her fans. If it’s a bad review, fans of their competitors will retweet it. Clickbait titles always work too although I wouldn’t recommend it because it will take away from you if you want to be seen as a serious writer. Same goes for playing into fan politics. But it will make you popular very fast. Do you keep track of which posts of yours are being read the most? Maybe you could concentrate on those more and stop writing the ones that don’t get views. That’s if that’s your goal. If it’s personal fulfillment, then anything goes! If it is so easy, why is no one else doing this with my posts? Every single thing I write goes up on twitter. I have something like 200 followers, most of them faithful readers/commenters. They all see these tweets. And they almost never share them or retweet them. Nor do they share me on Facebook, or in comments on other sites, or acknowledge me anywhere else in the world besides this one website. That’s what my tracking is telling me. People only find me through google. I’ll give you a simple example. I did a detailed unique analysis of the Tamil film Super Deluxe. A lot of other reviewers on other sites (especially Bardwaj Ranjan) also discussed the film and none of them had the angle I did. A lot of readers found me by googling “spoilers for Super Deluxe”. I now have almost a thousand views on that post, and a handful of comments saying “interesting review, new perspective, so glad I read it” like that. Not one single person, NOT ONE, bothered to go to the other reviewer’s websites and post a link in the comments there saying “hey, you should check out this review on another site”. Not one person retweeted it, not one person even shared it on Facebook. NOT ONE. And if the answer is “people are scum and will never do this for you”, then I’m shutting down the blog. I wrote and scheduled a “Good-bye” post two months ago because I got no response to my cry for help on social media that month. I rethought it at the time, but it’s still in my drafts section. And now I’m gonna shut the door to my office and cry for a bit, and then have lunch. Practically speaking, people generally follow hundreds of people on twitter so I doubt most of them are even seeing your twitter posts. There are literally thousands of tweets on your timeline so most people don’t even scroll down to look at them all. You would be lucky if you got even 3 or 4 retweets with only 200 followers. It’s not just you – this is a problem for *everyone. * Look at Aamir Khan’s latest twitter post. He is a celebrity with almost 25 MILLION followers and he put in time to upload a whole video he made with his wife and it got a grand total of 623 retweets! That’s it. 623 retweets out of 24.6 million followers. I doubt referrals will get you many views. People generally see links posted anywhere as spam and hardly click them. Many forums and websites don’t even allow people to post links. For Super Deluxe, you views would have risen quicker and higher if you were tagging the actors and directors and people associated with the movie. I don’t know anything about South Indian movies but if those actors have fan clubs, tagging them would have gotten you the right audience too. Digital marketing is an art and you have to set your targets correctly. A general person posting a link on twitter won’t do anything. Let’s say someone has 50 followers. Out of that, maybe 5 are interested in movie discussion and maybe only 1 or 2 in a specific movie. Those 1 or 2 might not have time to read anything at that time. Or if they do read it, for them to convert into members who write comments is a greater leap. It won’t make the big difference that you think it will. Sorry, but there is a logical fallacy here 🙂 If I can make a difference by putting in a lot of time and promoting myself on twitter, than you can make a difference by putting in a lot of time and promoting me on twitter. Better yet, you put in a little time and a dozen other people put in a little time, and it ends up having a big effect. What’s interesting about links on other sites is that they work, so long as they are natural. I had a link posted on a Bardwaj Rangan review to a review I wrote of the same film. We both do detailed long form reviewing, and it was on the exact same film, so it was an easy fit and I got over 200 click throughs. Same with a link on a long post about Kabali on another site from two years ago. And a link in a Sridevi Facebook fan club. Maybe I’ve been linked more times than that and the comments were blocked as spam, or no one followed them because they weren’t appropriate to the topic. But when it is at all relevant, there is an immediate enormous effect (that Bardwaj Rangan comment got me over 200 new views). OK — You’ve convinced me. I’m going to have to figure out Twitter and other re-posting strategies. About Saand ki Aankh: yeah!! Or Deepti Naval! Going to be extremely put out if they are playing 60 year old women! About India’s Most Wanted: Agree with your assessment but will probably watch because I love big fluffy Arjun. Deepti Naval and Neena Gupta! I would watch the heck out of that movie.